An athletic looker. What’s not to like? 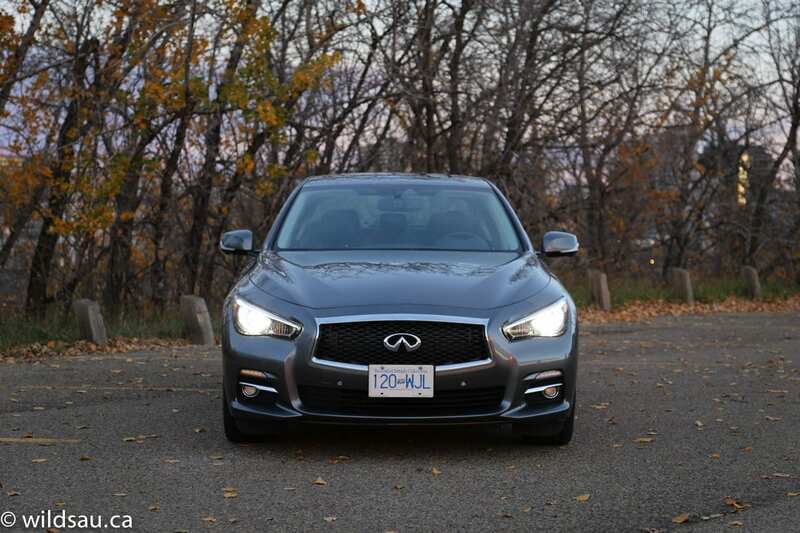 The Q50 is a great looking ride. I love that it’s stylish but not overstyled. 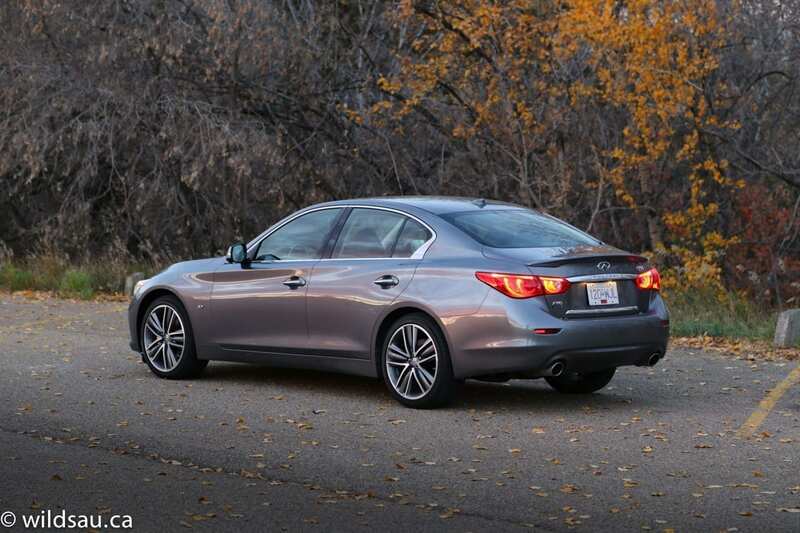 Infiniti lets it look aggressive and sporty, giving it pronounced creases in the bodywork and plenty of eye candy, yet it retains a luxurious appearance at the same time. 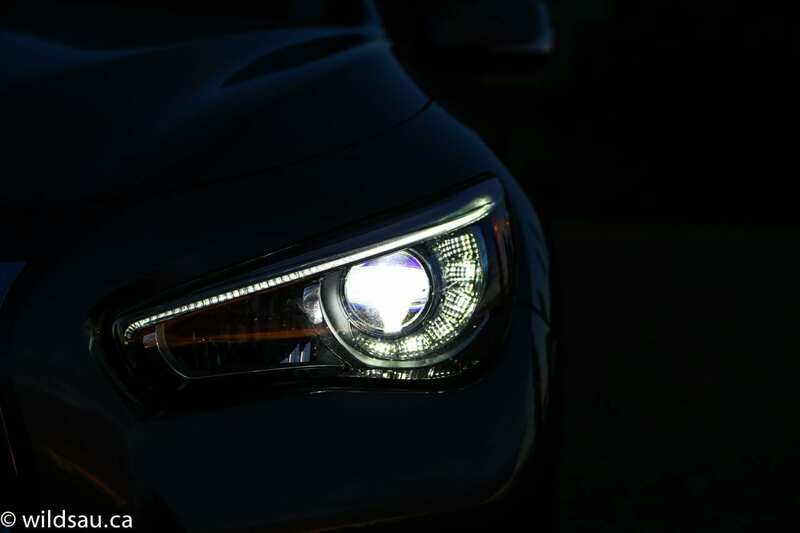 Eye-catching LED headlights, fog lights, tail lights, and big fat 245/40-sized tires wrapped around beautiful 19-inch rims complete the package. It’s very nice inside too. The materials are excellent, with soft-touch plastics throughout as well as real maple wood and aluminum trim, and the fit and finish is outstanding. 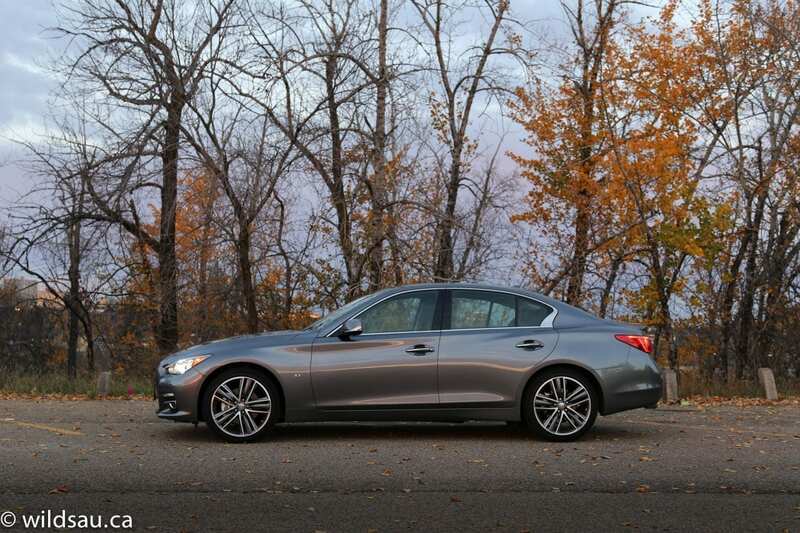 The cabin’s styling isn’t spectacular or ground-breaking, but works well. We found the heated leather-appointed seats very comfortable (even on a longer highway trip) and very well bolstered, and the heated power-adjustable steering wheel feels great in hand. 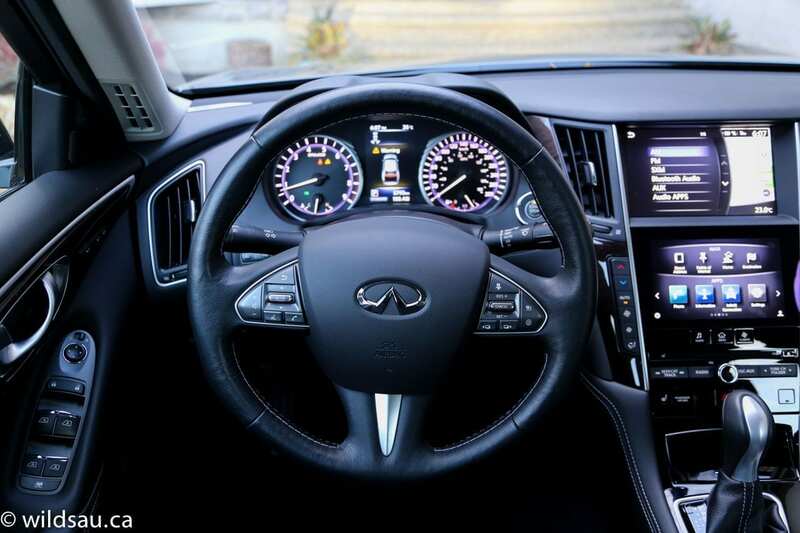 Infiniti’s InTouch dual display system with an 8-inch screen on top – it’s slightly sunken in – and a 7-inch screen below which is completely flush looks after phone, navigation, climate control, apps, vehicle settings and media functions. The 14-speaker BOSE system – including a 10-inch subwoofer – sounds very good! In this system, both screens are touch-screens, although the upper one acts more like a display screen, and the lower one is essentially a dynamic control panel. You can see fingerprints on the lower one immediately – it’s actually terrible when it comes to this. That said, the interface is quite good and relatively user friendly and an improvement on the previous system. 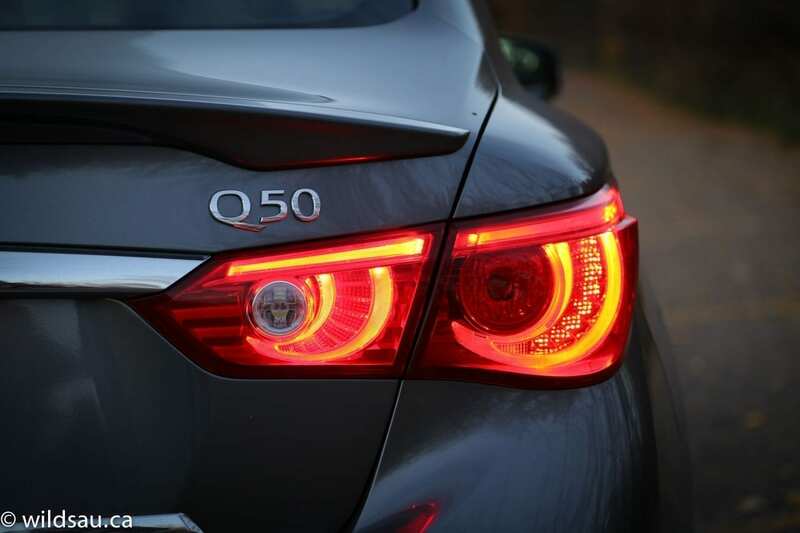 The loaded Q50 I reviewed included a ludicrous amount of driver assistance technology – around-view camera with moving object detection, front and rear parking sensors, forward emergency braking, direct adaptive steering, distance control assist, predictive forward collision warning, adaptive headlights, automatic high-beam assist, blind spot warning and blind spot intervention, back-up collision intervention, intelligent cruise control, lane departure warning and active lane control. Wow!!! 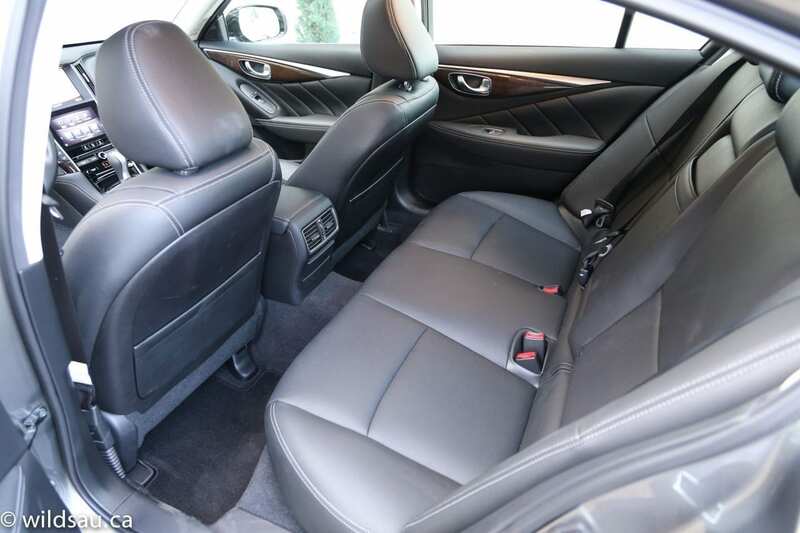 The back seats are also a very happy place to be – they are some of the most comfortable rear seats I’ve sat in to date. Head room is acceptable – at 5’10”, I had a couple of inches to spare, and leg room is decent as well. The middle seating position will require anyone sitting there to straddle the very tall tunnel and it’s not an enjoyable place to sit for adults or kids – none of our three little ones were happy to be relegated to the sitting in the middle. I found the cabin storage to be limited – small door pockets, a couple of cupholders and only an ashtray and a small carpeted bin under the armrest lid in the console. 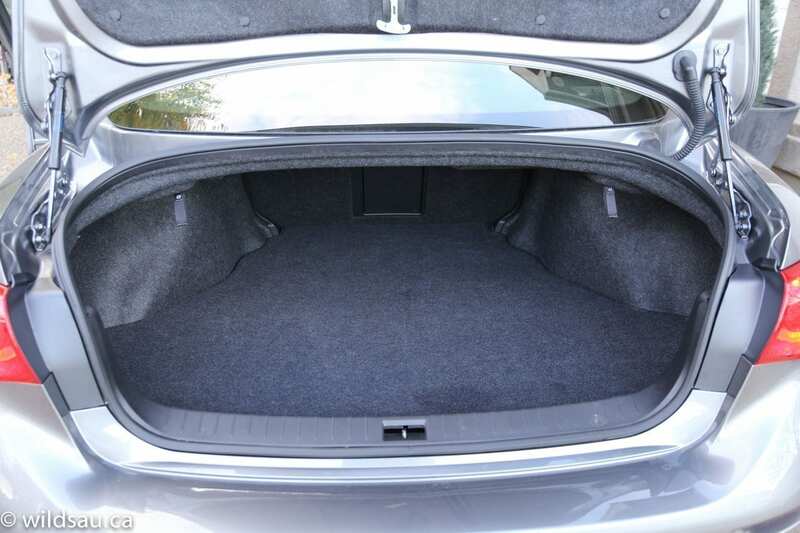 The 382 litre trunk is large enough to be useful – it’s quite deep (length-wise) but not very tall. 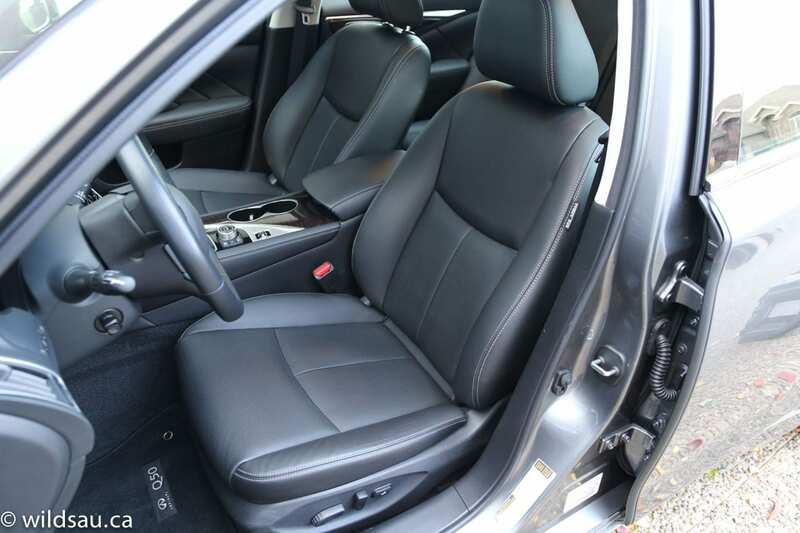 You can add to it by folding down the 60/40-split rear seats. 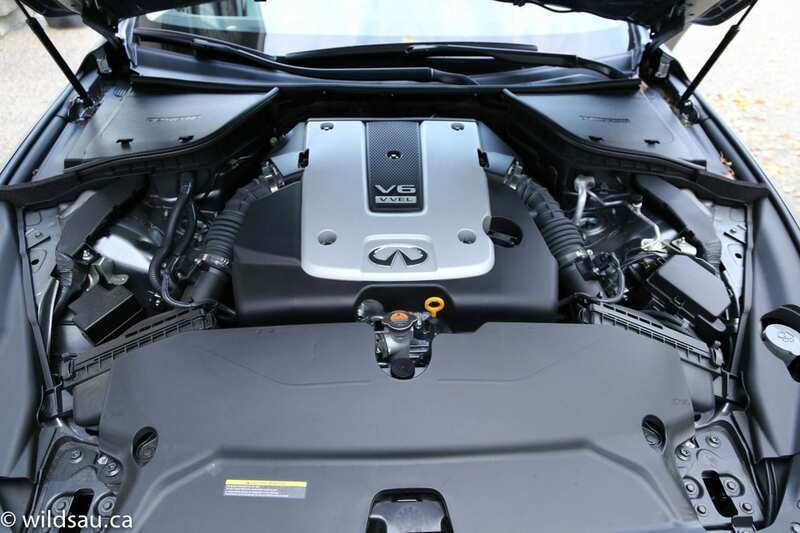 Infiniti’s well-known and proven 3.7-litre V6 puts out 328 HP at a lofty 7000 RPM and 269 lb.ft of torque at 5200 RPM. The transmission is a 7-speed automatic and my tester was all-wheel drive. 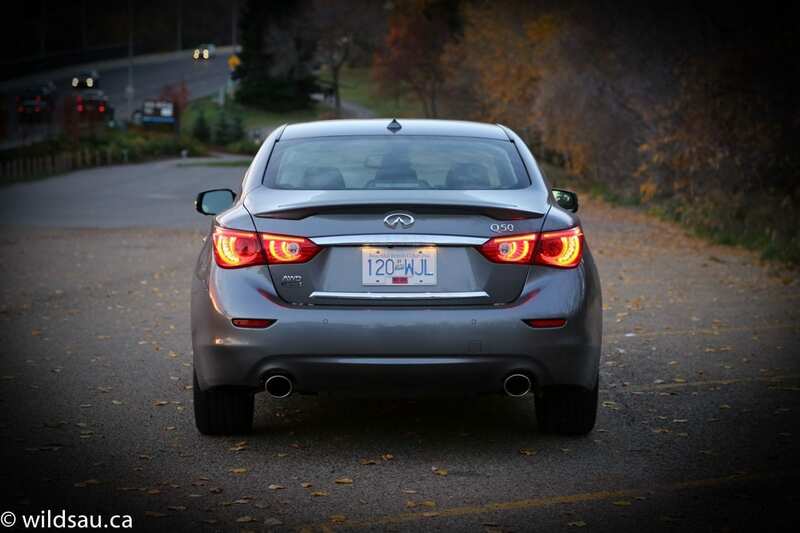 Mileage is nothing to write home about – Infiniti rates it at 12.5 L/100 km (19 US mpg) city and 8.7 L/100 km (27 US mpg) highway. I achieved a less than impressive 10.9 L/100 km (22 US mpg) average – surprisingly low since it included about 400 km of highway travel. 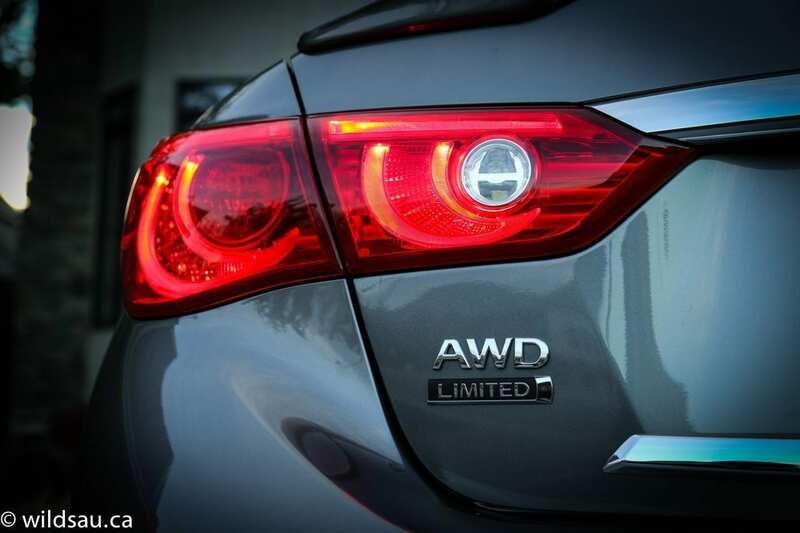 The car redeems its fuel economy once you’re on the move. 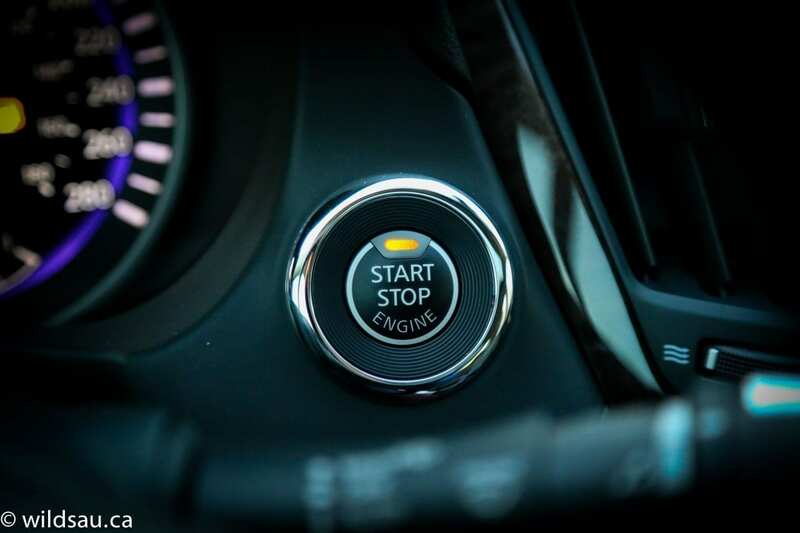 The power is instant and it builds in a very linear fashion – the car pulls surprisingly hard right to redline and is thrilling to drive. 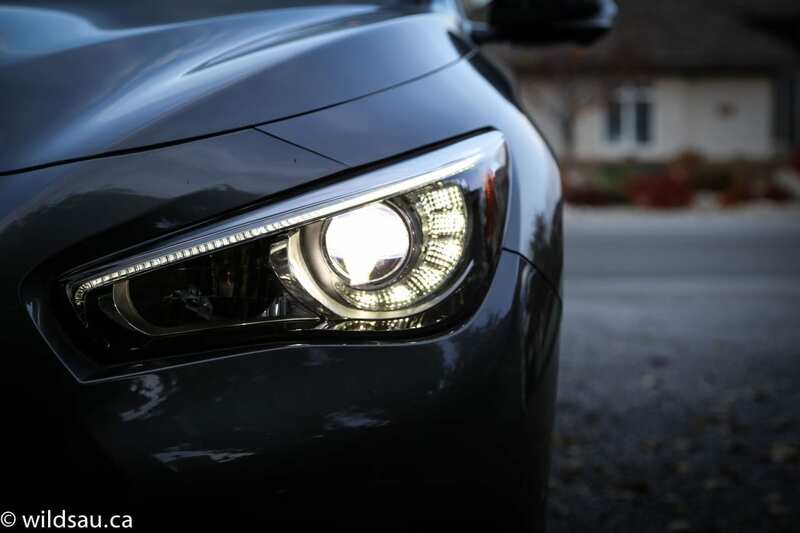 All this power makes driving feel effortless in any situation – it’s docile around town, but getting into traffic or passing at highway speeds is a complete non-issue. 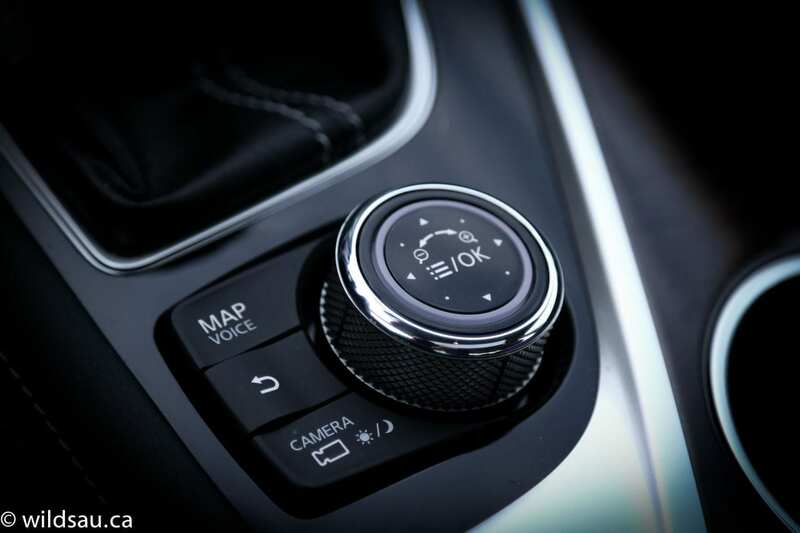 There’s a drive mode selector allowing the driver to choose between Standard, Sport, Snow, Eco and Personal modes which impact the car’s responsiveness and suspension settings. 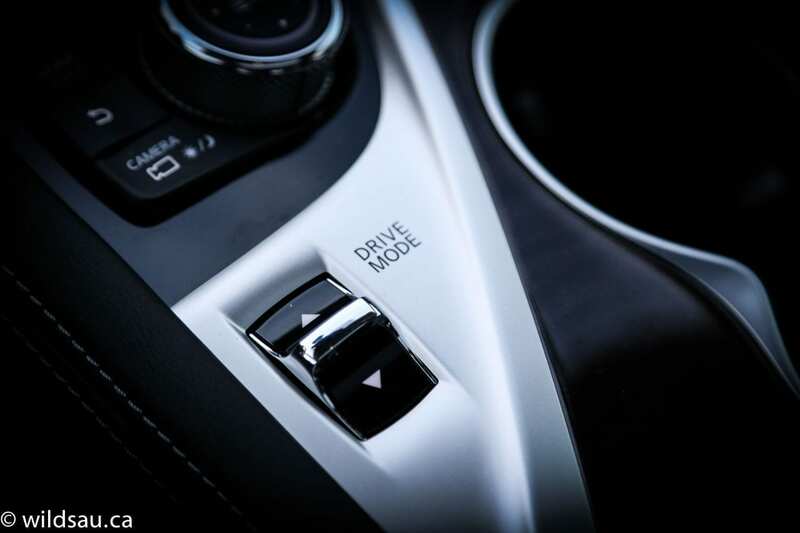 The smooth transmission can be manually shifted using the gear selector – downshifts are perfectly rev-matched, which is pretty awesome! I was surprised at how hugely variable the steering effort is – it becomes downright heavy (in a good way) in Sport mode. 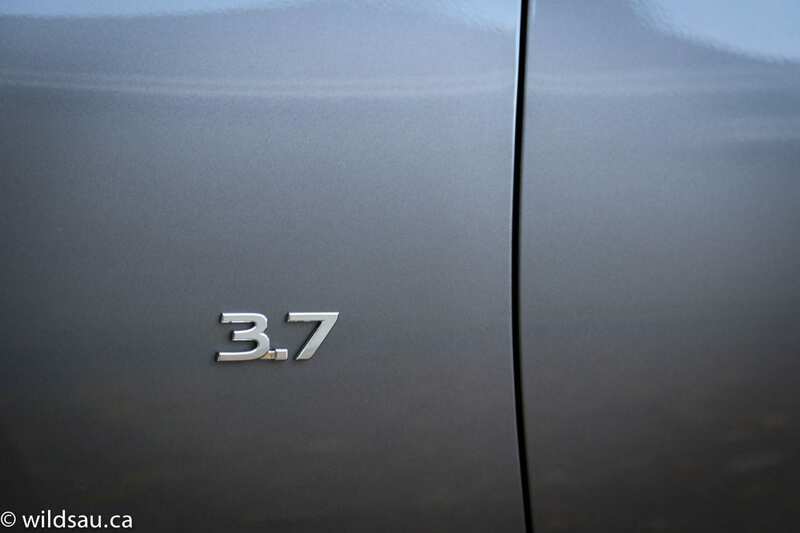 Likewise, the handling of this 3787 pound (1718 kg) sedan is freakishly agile when it’s in Sport mode – remaining remarkably flat, it bites into corners and while it does understeer, it is able to change directions like a big sports car rather than a roomy sedan. Very impressive. 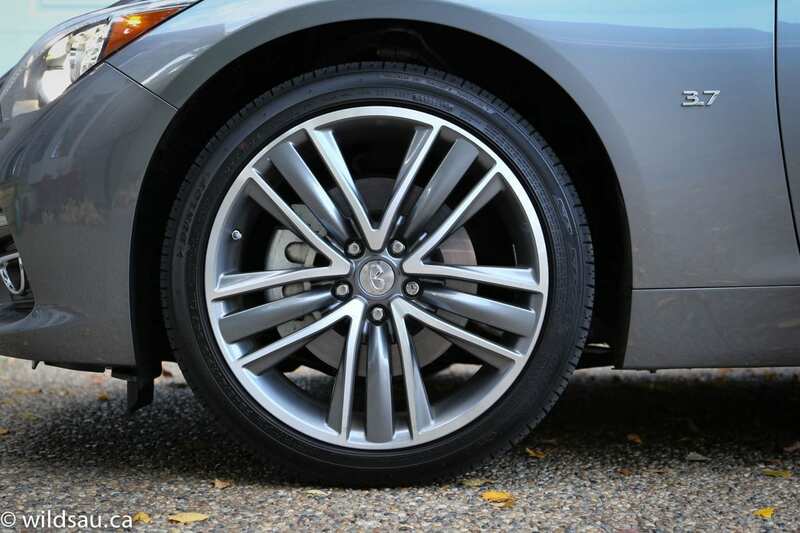 Traction was never an issue, and the all-wheel drive system leans toward sport – a characteristic that I loved. I did notice quite a bit of road noise which is likely tire-related, but there’s no wind noise to speak of, even at high speeds. 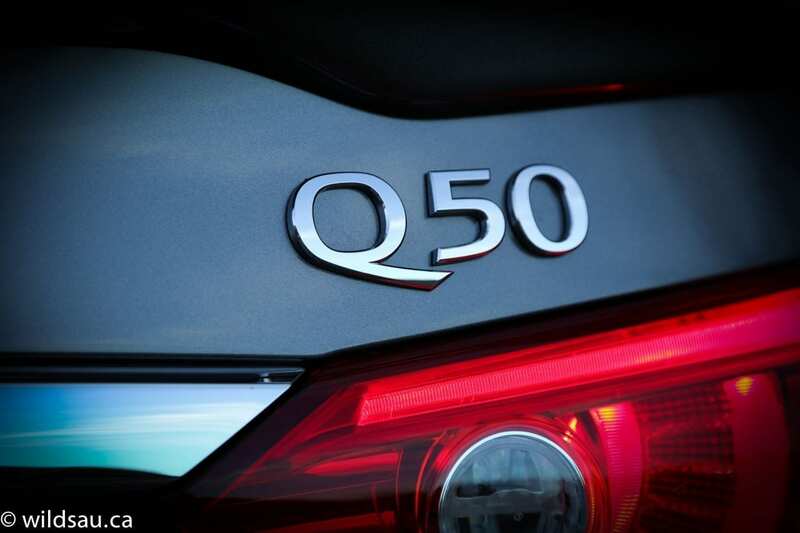 The silky V6 engine sounds great when you step on it, and otherwise remains quiet – on that note, the Q50 sounds fantastic from the outside too and doesn’t hide its sportiness. Driver visibility out of the car is just OK – the rear view isn’t great as the headrests get in the way and shoulder checking isn’t much fun. 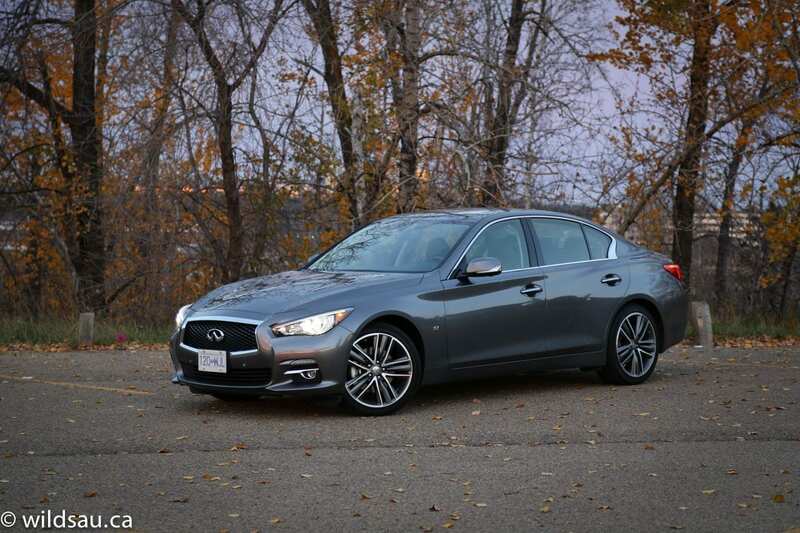 This aggressive-looking but stylish sedan is nothing if not sporty and on top of all that, it’s absolutely loaded with technology and comes in as a true value when compared to the competition. WAF (Wife Acceptance Factor) was quite high. She thought it looked stunning and was easy to drive around town. She found the ICE system a bit tough to get used to, but eventually figured out the touchscreens. 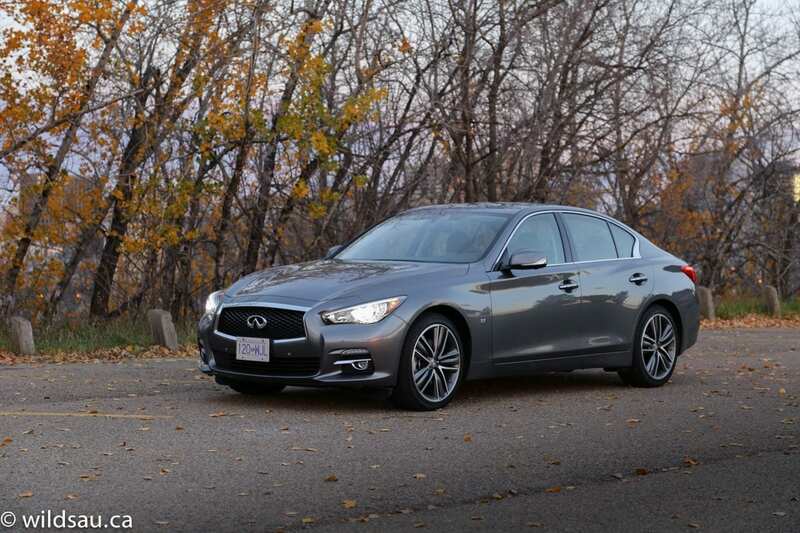 The Q50, especially loaded up like my optioned-out Limited trim, is simply a fantastic car. 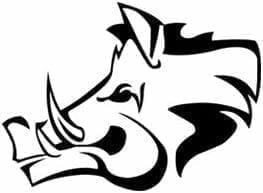 It keeps you comfortable, but will run with the big dogs all day long when you step on its tail. I love it!